The whole world loves cat food. 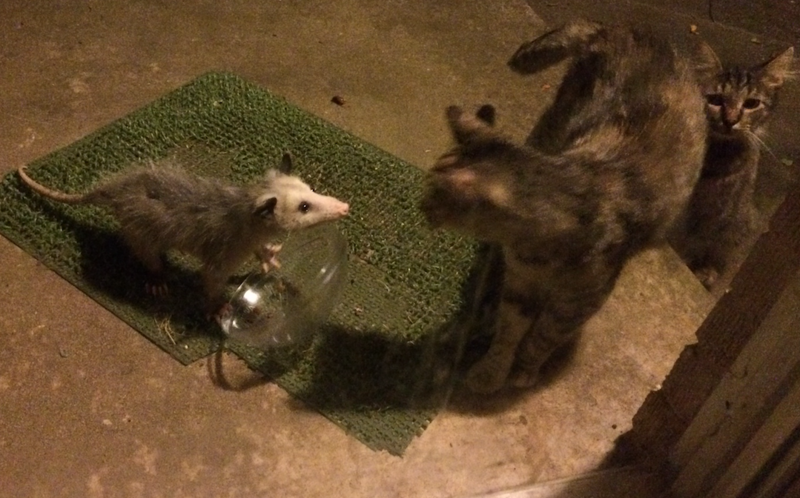 We get possums and raccoons when I forget to bring in the porch kitties’ food. We live in a small town in north-central Texas. I’m rarely without a lap cat, and sometimes three. 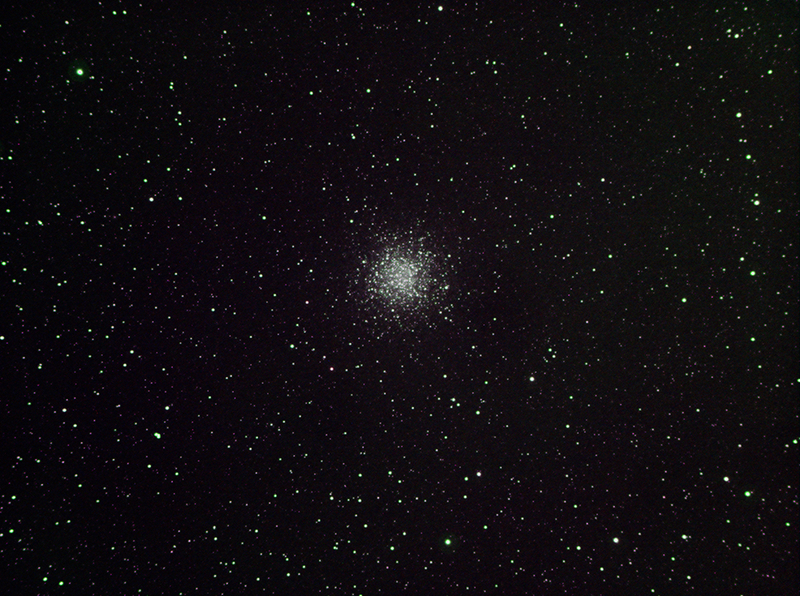 This image is of the globular star cluster NGC6809, also known as Messier 55. The cluster lies in the Sagittarius constellation and is approximately 100 light years across. Imaged in narrowband (Hydrogen Alpha, Oxygen III and Sulphur II) with a monochrome camera and a 110mm refracting telescope. Thirty 60-second images in each emission band, stacked and combined to form the final image. Here are some more photos by Doug Hayes. 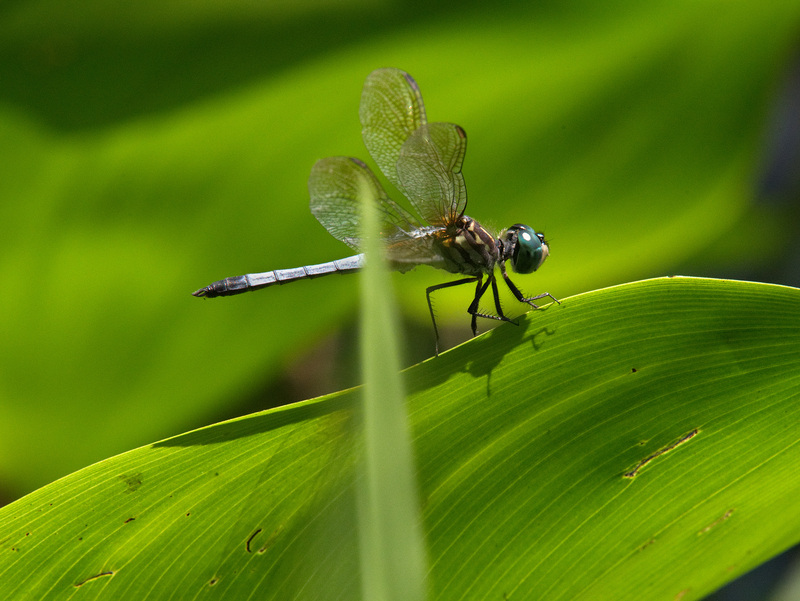 The dragonflies and turtles were photographed this morning [August 26] at Forest Hill Park in Richmond, VA. 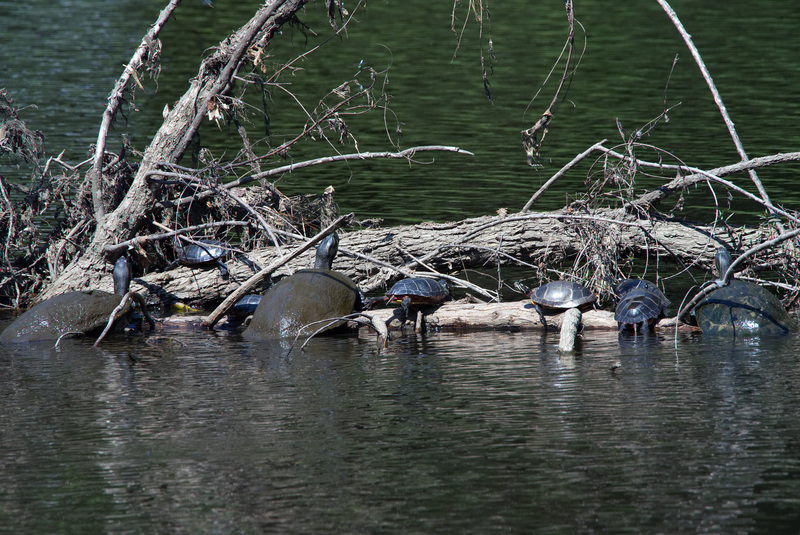 The turtles look like a combination of painted turtles (Chrysemys picta picta) and red-eared sliders (Trachemys scripta elegans), but I could be wrong as I’m not a biologist. 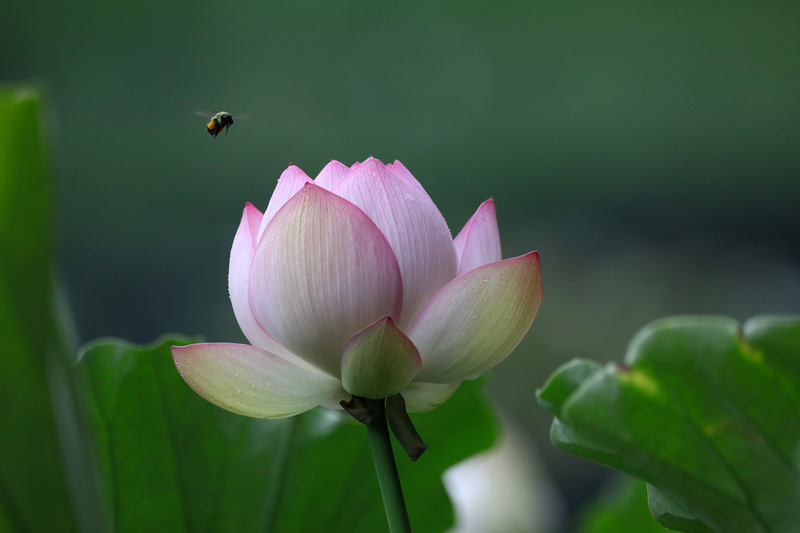 The bee with the lotus appears to be a bumblebee of some kind, possibly Bombus lapidarius. A friend of mine thinks the orange on its behind is from the pollen sacs but I’m not sure. Maybe one of your readers can clarify. Does anybody know the species here? Original photo “art” by PCC(E). What, pray tell, is this plant? I found it sodden and squashed on the sidewalk after a heavy rain the night before last. This entry was written by whyevolutionistrue and posted on August 30, 2018 at 7:30 am and filed under astronomy, insects, mammals, photography, plants, reptiles. Bookmark the permalink. Follow any comments here with the RSS feed for this post. Both comments and trackbacks are currently closed. Coleus was also my first guess. My first impression, too. (A semi-pressed Coleus). Add me to this guessing list. I think you got it. There are lots of cultivars of coleus, all with lovely vari-colored variegated foliage. It’s in the Lamiaceae family, so Draken’s comment is not far off. And one common name is “painted nettle”. Coleus used to be it’s own genus, but now it’s Plecranthus and most of our ornamental coleus are probably Plectranthus scutellarioides. I concur with all of you. I’d say some form of Lamium (Deadnettle). I’m not very savvy about plants but the leaves make me think it might be something related to basil and mint. Except the stem is pretty stout. 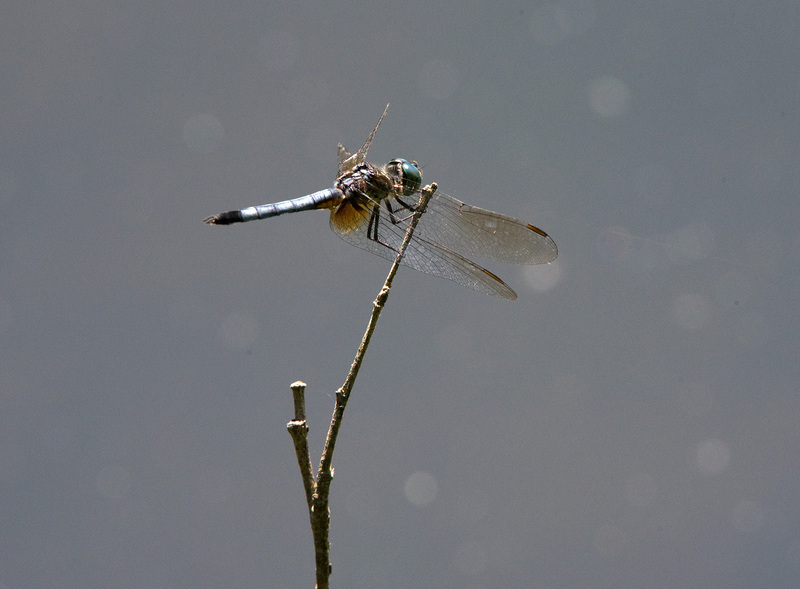 The dragonfly is a male Blue Dasher. Thank you for the identification. Much appreciated! Great possum pic & possum pic [reveal]! S/he ain’t playing possum though so I’m guessing this possum must have met those two kitties before & has them marked down as wimps. I would like to know what happened next . These fine images run the gamut from the ridiculous to the sublime. When I read that M55 is 100 light years across, I tried to imagine what that means. I couldn’t. Too damn big. But checking Andromeda – 220K, and the Milky Way – 100K, it’s really a little guy. Still, it’s hard to give meaning to such numbers. You wouldn’t want to walk it in your bare feet. The last image makes me think someone didn’t want to finish their vegetables. The diameter also means that if our planet was orbiting a star on one edge of the cluster, then our first radio transmissions would just now be reaching stars on the opposite side of the cluster. That depends. Globular clusters don’t have defined edges – there are stars gravitationally bound to the M55 cluster, but much further out than 50 ly. There are a couple of different conventions for how to measure their diameters. A light year hear, a light year there, pretty soon you’re talking about real distance. Many of these globular clusters orbit their parent galaxy in the ‘wrong’ direction. Strange objects. That would suggest they are captured by the parent rather than originated with the parent. N’est-ce pas? Nearly everything in this yellow disc orbits around the centre in the same direction & bobs up & down as it goes around like fairground horses. Orbits are more or less circular. Then there’s the Halo where the M55 globular cluster lives – this is where the oldest stars hang out & thus they are metal poor. These stars are as randomly orientated orbitally as the ones in the red sphere & they also have mainly oval orbits. PS Astronomers are weird – by “metal” or “metallic” they mean ALL elements except hydrogen & helium. The bee is carrying a large load of pollen in its pollen sacs / pollen baskets. The baskets are a comb of long hairs that project across its broadened hind legs. Some years back I set out some traps for rats that had nested along the edges of our house. Before finally catching the pair, I managed to trap a possum (these were humane traps). Of course, looking at it one way, possums are some of the world’s biggest rats (consider the tail). Anyway, the point: Possums have a very woodsy, gamey smell to them. The ones I see in Richmond, Va., tend to have pointier snouts and tails a bit longer than the one in the photo. My Big Orange Kitty once sniffed up to a possum to check it out, and the possum hissed–just once–and made Kitty back off. The plant looks like a nettle to me. 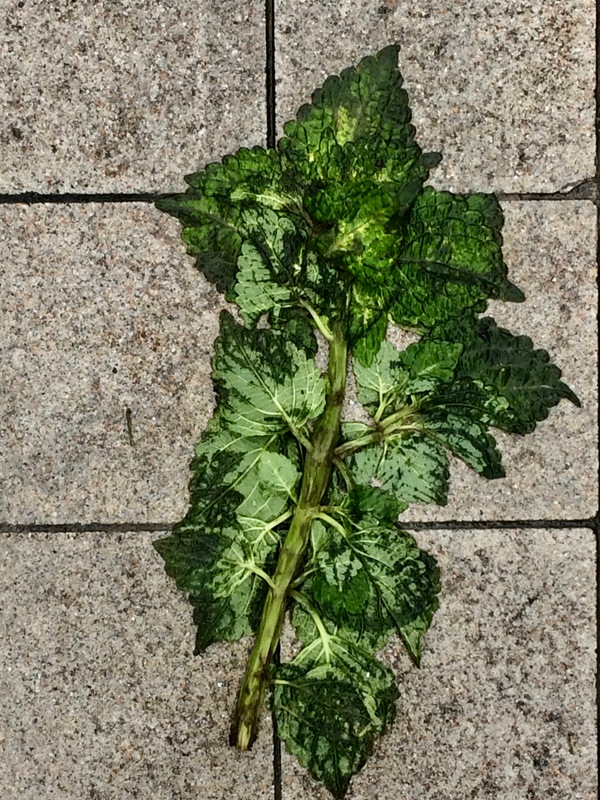 I posted the photo of a partly squashed sidewalk plant to the Plant Idents Facebook page, which is where I go for identifications that elude me. Answer? Coleus. Common house plant in the mint family (Lamiaceae). Most popular cultivated forms have interesting leaves with red, yellow, and green patterns. Yours is pretty plain. The square stem is an indicator of the mint family. One theory is that they are “failed” dwarf galaxies, collections of material that weren’t large enough to form into a spiral or elliptical object and were eventually absorbed into a passing galaxy such as ours. Google says that’s what you call juvenile possums because they are marsupials. 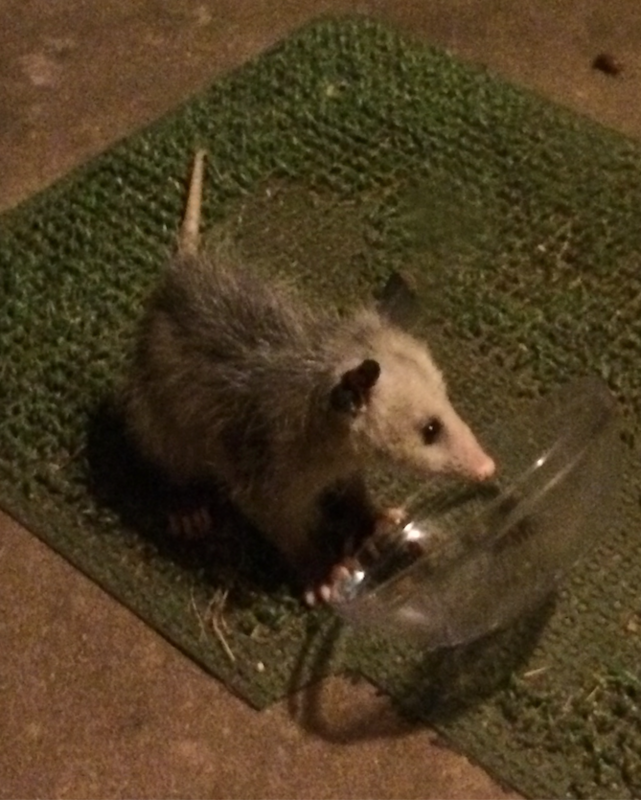 Also, I’m from the south, so we call ’em possums, not Opossums. To me, the plant looks like a stinging nettle.